Who doesn’t want a bedroom that’s comfy and cozy? Choose bedroom colours that are inviting so you and your guests can get a good night’s sleep. Rich, deep tones of brown are warm and cozy. They create a look that’s dark enough in which to sleep, but still warm enough to let you wake up in a good mood. If you’re afraid of going too dark, choose cream or white for most of the fabrics in the room to help create balance. Purple is an odd colour: Depending on the shade, it can be warm or cool. Stick to warm colours for an inviting bedroom feel. Plum tones (the warmest ones have red undertones) are perfect for a room that’s modern, classy and comfortable. Be careful with your blues. Blue is a calming colour, which makes it great for bedrooms. The problem is that the wrong shade of blue can be downright depressing. Opt for an aqua blue to invoke a beachy feel or a pastel blue to make you think of the sky. Avoid deep or bright blues because they can make bedrooms feel a little too dark and depressing. Sometimes, less is more — especially in a bedroom. Go with a neutral tone in this room, where you want to leave the world behind and drift off on your own. Need a little more colour than that? 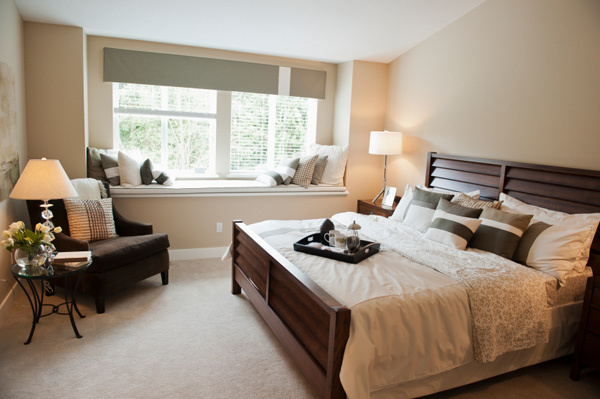 Use fabrics, pillows, candles and paintings to bring an accent colour to the space. Bright yellow is just too stimulating for a room where all you want to do is sleep. Instead, go with shades of gold. These deeper takes on yellow and orange are still warm and cozy but a little more conducive to sleep.